There are a lot of opinions when it comes to nutrition and more and more we’re seeing more science involved in figuring out what we should be eating. Taking a look at all of this info we can see some similarities or commonalities that seem like reasonable info for basing our nutrition plan. One of the many reasons nutrition is hard is that everyone is different. Your metabolism is faster or slower, you are more or less active, and your body deals with foods differently. There is no ONE exact diet to rule them all, but we've found our blueprint to be effective for almost everyone. Our goal with this blueprint is to deliver a healthy body with a low body fat percentage. And to have plenty of energy to get through the day and do some exercise. This will not be a get super lean and have 8-pack abs diet. It’s really hard to want to make any lifestyle change when you don’t feel well. Especially when so many people have an emotional relationship with food. You feel bad so you comfort yourself with food and then you feel worse. It’s a downward spiral that’s hard to get out of. We recommend taking a multivitamin and some fish oil everyday to help reduce inflammation and supplement the missing nutrients you’re not getting in foods your currenlty eating. This should help you feel a little better and be more apt to make the dietary changes recommended in this blueprint. It’s also a really good idea to get some exercise and sunshine everyday. The vitamin-D from the sunshine will improve your mood and exercise releases endorphins that also improve your mood and outlook on life. Not everyday needs to be formal training in the gym but 3-4 days in the gym and a couple days just going for a leisurely walk or bike ride will do. Now that you’re feeling a little better about life and have a little more energy let’s talk about what you’re putting in your body. What if the food you ate actually made you feel better and thus more likely to want to continue on the journey of losing weight or being healthy? That’s what we’re after. We want to eat whole foods that have been raised naturally. Food like substances that come overly processed in boxes with mix in powders are not a good decision. Stick to the edges of the grocery store when purchasing foods. These kinds of foods easily fall into one of three macronutrient categories, and don't have ingredient lists to read. Most food items that come directly from animals are considered protein. Protein is necessary for strong muscles. The body breaks down protein into amino acids that are the building blocks of muscle and increased muscle helps increase your metabolism and thus helps reduce body fat. Commonly known as carbs these are not as evil as some diets make them out to be, but the source that they come from matters. We want our carbohydrate sources to be limited to fruits and vegetables. A little bit of grain now and then is ok but should not be your primary source of carbohydrate. 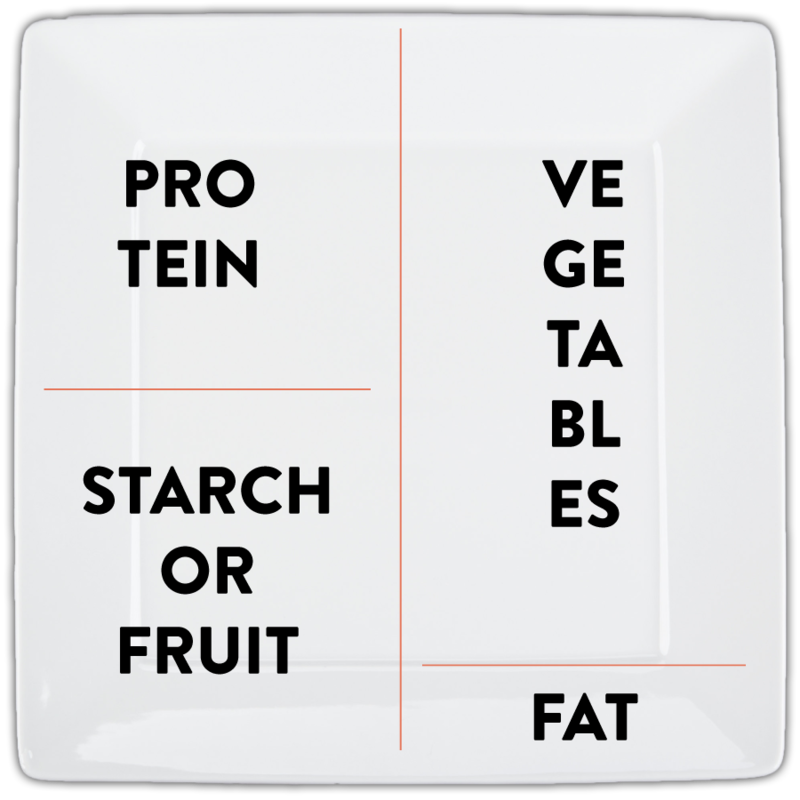 We actually split vegetables and fruit/starch into 2 categories for keeping meals balanced (which we will lay out below). Dietary fat has received a bad reputation in the past. There are good fats that the body can use for energy and help us keep a low body fat percentage. We recommend getting most of your dietary fat through nuts and seeds but there are a couple other sources that are also acceptable. If you stick with these kinds of foods you’ll be giving yourself a lot of the micronutrients (vitamins and minerals) that we are supplementing with the daily multivitamin and fish oil (only if you eat oily fish for your protein). You’ll also be reducing inflammation in your joints and improving the health of your GI track. The one thing you will notice is NOT on any of these lists is sugar. Reducing your sugar intake to almost zero will drastically improve your health and body composition. This includes added sugar, but if you’re eating the types of foods recommended above then they won’t have any added sugar. Take a few weeks to adjust the foods you eat. Don’t worry about quantity just get into the habit of eating good healthy foods. It is possible to have too much of a good thing. Even healthy foods. One thing that helps us keep our intake to appropriate levels is realizing that food is just fuel for your body. If you want your body to look and run well you need to fuel it appropriately. But unlike the fuel tank on your car it doesn’t automatically shut the pump off when it’s full. We have to learn to self regulate. For our blueprint we recommend eating three t0 five meals a day. Each of these meals should contain protein, carbohydrate and fat. We use a simple and appropriate tool to figure our portion sizes. Protein should take up 1/4 of your plate. Strach or Fruit should take up 1/4 of your plate. Fat should limited to an area the size of your thumb. Women should eat 3-4 meals a day. Men should eat 4-5 meals a day. Eat balanced meals of protien, carboydrate and fat. Eating for performance is going to be a little different but still based on this blueprint. It’s different for each individual, requires some experimentation and more accurate weighing and measuring of meals. For 90% of the population the blueprint we’ve laid out here should be more than sufficient. If you have more questions please get in touch with one of our coaches. Newer PostWhy are CrossFit gyms more expensive?